RARELY AVAILABLE SPACIOUS 5 bedroom DETACHED family home, NON ESTATE and SOUGHT AFTER LOCATION, within a few minutes walk to Buckingham Primary and catchment for both BUCKINGHAM SECONDARY and ROYAL LATIN GRAMMAR SCHOOLS. This lovely property is APPROX 2900 sq ft and is approached via gated access to gravel driveway and the accommodation comprises: Entrance Porch, reception hallway, open plan family room with feature gallery landing, opening through to dining hall, conservatory, study, sitting room with two sets of French doors leading onto the enclosed and private rear garden. 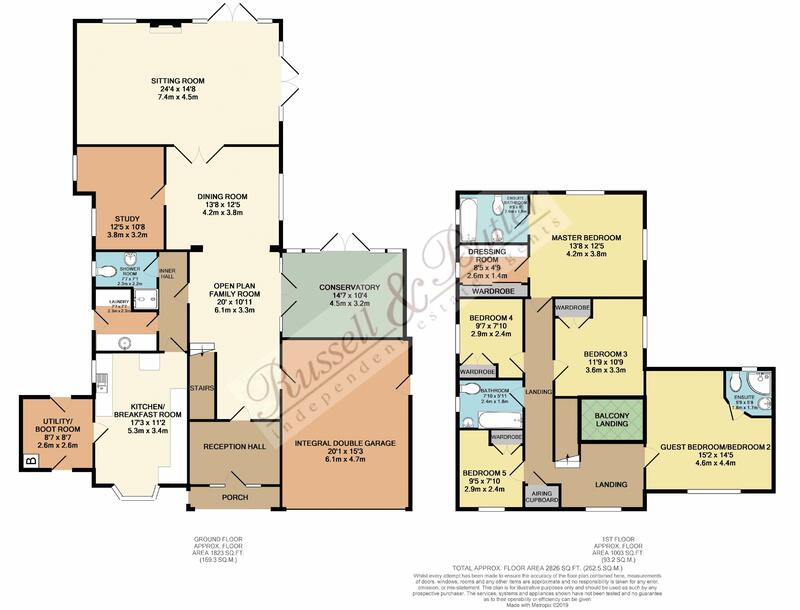 Kitchen/breakfast room, large utility room, laundry room and ground floor shower room. To the first floor, feature open landing which can be used as a reading or office space, master bedroom with walk in dressing room and en-suite bathroom, guest bedroom with en-suite shower room, three further bedrooms and family bathroom. Gravel driveway to the front providing off road parking for several vehicles, double width garage and mature enclosed gardens to the rear. EPC Rating C.
A spacious sitting room two sets of French doors to side and rear aspects, coving to ceiling, radiator, Upvc double glazed window to side aspect, feature fireplace with fire as fitted. Glass roof, ceramic tiling to floor, radiator, double glazed French doors to patio. Two Upvc double glazed windows to side aspect, radiator. Replacement 'Worcester' gas fired boiler (approx 3 months old) serving both domestic hot water and radiator central heating, personal door to front, door to rear, tiled flooring, double panel radiator. Inset round sink unit with cupboard under, space and plumbing for washing machine, space for tumble dryer, part glazed door to rear, a range of base and storage units with worktops over, ceramic tiling to splash areas, wall mounted electric heater. White suite of fully tiled shower cubicle with shower as fitted, low level W/C, wash hand basin, ceramic tiling to splash areas, window to rear aspect, ceramic tiled floor, wall light point, coving to ceiling. Mezzanine landing which lends itself for a quite reading/library area overlooking the spacious dining hall, two wall light points, radiator, double width airing cupboard. Built in triple wardrobes with hanging rails and shelving as fitted, window to side aspect, built in drawer/dressing table, window to rear aspect, radiator. Re-fitted white suite of panel bath with mixer tap shower attachment, bidet, low level W/C, pedestal wash hand basin, coving to ceiling, half height ceramic tiling to walls, radiator. double glazed window to side aspect. White suite of fully tiled shower cubicle as fitted, low level W/C, pedestal wash hand basin, full height ceramic tiling to walls, radiator, extractor fan, double glazed window to rear aspect. Double glazed window to side aspect, built in wardrobes, coving to ceiling, wall light points, radiator. Having the benefit of built in wardrobes, radiator, coving to ceiling, loft access with ladder, light and boarding, double glazed window to front aspect. White suite of panel bath with separate shower over, low level W/C, pedestal wash hand basin, window to rear aspect, ladder/heater towel rail, full and half height tiling to walls. Approached by five bar wooden gates, established shrub and tree planting, gravel driveway leading to property entrance and double width garage, providing parking for several vehicles. gated side access to rear garden. With up and over door, light and power connected, personal door to side aspect. A mature and well established rear garden, laid mainly to lawn with large paved patio, fully enclosed by brick wall and panel fencing. Radiator, coving to ceiling, wall light point.